Great vanilla and caramel aromas with oak tones and smooth finish. Very good whiskey and decent value. Spicy Vanilla with a long finish. Very much what "bourbon" should be. Spicey, with notes of vanilla, licorice and floral. Bold flavor and oily mouth feel. Nice long finish. The more I drank this, the more I grew to appreciate it. Notes of vanilla and sweet spices. Spicy with notes of dark chocolate. Some fruity notes appear. Oaky notes and dark chocolate on the finish. Too sweet for me. It was very smooth though. It's probably be good in a cocktail. Was good in coke. Not a huge fan with ginger. Have yet to try it straight. Very nice. Good balance and easy drinking for 100 proof. A good sweet bourbon, nice for sipping after supper. A good bourbon. High rye with high spice. Lower sweet and vanilla notes. ABV 50%. A decent bourbon that rounds up over time in the bottle. Sweet taste with hints of caramel and vanilla. Works fantastic on an Old Fashioned. Shame it's just a tad over-priced here in Finland. Excellent choice for my 1st single barrel bourbon. Subtle nose. A bit of burn but tons of flavor. a very sweet caramel. little spicy neat due to the abv. small amount of oak at the finish. the finish is rather short. very easy bourbon neat. 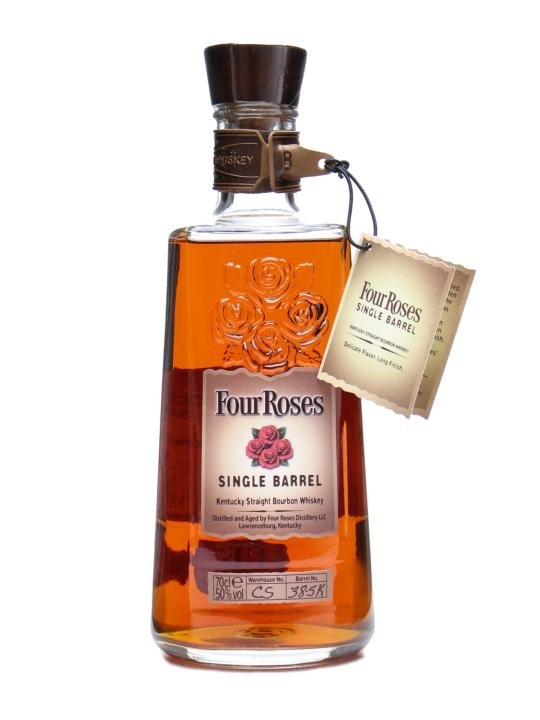 Similar notes to the traditional Four Roses with caramel and brown sugar sweetness with a bit more bite and complexity that make it well worth ~$40 price range. Great bourbon for right around $40. Very enjoyable flavor for sipping with a little ice. The rye spice isn't overpowering and has well balanced finish. Not very consistent, but the good bottles are really nice. Rye spice, vanilla, leather, tobacco, apple notes. One of my favorites to sit and sip. Easy sipping bourbon. Vanilla, banana, something a bit sour, but not unpleasant. Un bourbon titrant 50 un cran au dessus des grands classiques. Cherry, chocolate and oak all the way through for me. Can't really go wrong with any of the Four Roses, unless you way overpaid for some limited edition. go to bourbon. caramel, vanilla and spice with a hint of cherries. My go to sipping bourbon. Sweetness, fruitiness, oak. Taste: berrries, pears, and allspice. Bold, spicy with a lasting flavor after taste. Great bourbon with notes of plum, raising, cherry and vanilla. Complex but still smooth without being too friendly. Ripe plum, vanillar, raisins and leather. Just a great great bourbon. vanilla and caramel notes. Sharp and spicy on the tongue with oaky finish. What a nice bourbon ... Was in to pick up a bottle of 4R Small Batch and found Single Barrel on the shelf. I secured a bottle and am glad I did. More complex than the Small Batch. May be a bit over priced at $41 USD, but I will add notes as the bottle expires. Floral, but it works! Strong butterscotch, followed by brown sugar and light vanilla. Toasted Oak up front followed by toffee, dark cherries and vanilla. Almost a light medium finish; it is hard to believe this is a 100 proof bourbon. Straight up or with a large cube good stuff. Everyone is going to hate me. I was utterly disappointed by this bourbon. I expected a lot more. Perhaps it's because they haven't had 8 year old buck at half the price. It's still a pretty good bourbon. Everything initially reminded me of Buck Bourbon, except the fact that Buck is more well balanced and way smoother. Pun intended. Spicy with a good taste at a great price. Add a single ice cube to lessen the harshness. Great bourbon at a good price. sweet with just the right amount of spice! Great whiskey for a bargain (€30)! spicy and Sweet with An 'Oily' mouthfeel. Better than the standard or small batch cousins and is a standard bottle you need to have in your collection! served well with Just a couple drops of water. Very oak-ly, smooth and smells great! Better with ice instead of neat.